French or Belgian 18th century morocco with gold tooling and 2 clasps. First owner: Ailly de Sains (? ), or desairs, or desalds, or desaids (arms: quarterly, 1-4, gules, bearing an inescutcheon gules a cross or a chief checky of argent and azure; 2-3, gules a bend dexter vaire of azure and argent; crest a demi-hound (? ), collared and langued gules, muzzled vert winged or; motto: changier ne veulx); purchased May 18, 1895 by Richard Bennett; Catalogue of manuscripts and early printed books from the libraries of William Morris, Richard Bennett, Bertram, fourth Earl of Ashburnham, and other sources, no. 32; purchased by J. Pierpont Morgan (1837-1913) with the Bennett Collection in 1902; J.P. Morgan (1867-1943). Ms. book of hours for the use of Amiens (Hours of the Virgin) and Rome (Office of the Dead); written and illuminated in France, probably Amiens, ca. 1480. 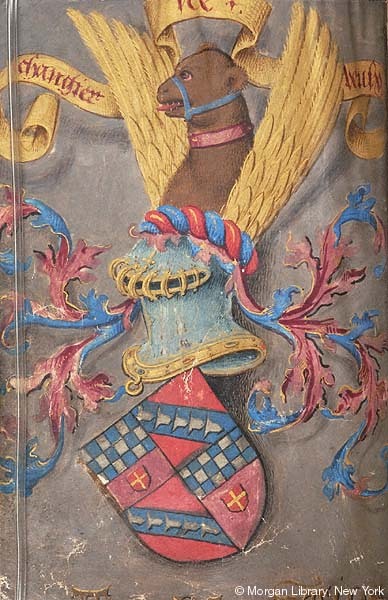 Decoration: 1 full-page illumination of arms on fol. 1v; 37 miniatures.